Today we’ve made a selection of kitchen lighting fixtures for your home design ideas. Take a look! 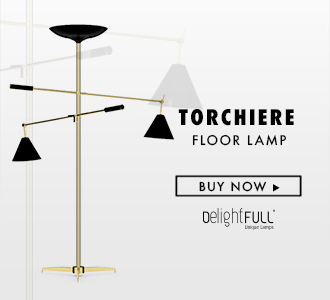 Inspired in a flower bouquet this is the Madeleine ceiling light by DelightFULL, its a brass lamp that will lighten up your kitchen! This is a light fixture by Serge Mouille. In this ambiance the cabinetry is custom made and the walls are lined with tiles by Ann Sacks. Light fixture by Stilnovo, the bar stools are a design by Philippe Starck. Silver spheres, pendant lights by the great designer Tom Dixon. A chandelier by Jonas Bohlin for Orso Belysning to give some light to this custom made kitchen table. White pendant lights by Louis Poulsen. A custom made and arts and crafts looking kitchen with circa-1935 pendant lights and a Wolf range. The flooring is Marmoleum. The simple simmetry of the pendant lights in this kitchen is great. Your cabinetry will be safe to work with this lighting, we are sure! A glass-toped table by Kelly Wearstler illuminated by clustered lights. A retro ceiling light that will look stunning in your kitchen design. Stanley Retro Suspension lamp by DelightFULL.